Since my last quarterly update we have had some industry shaking government imposed changes for which the full effect won’t be clear until well after fall. As this is just an update I’ll only provide my concise view on each of the topics with links to my reasoning provided. High end of market will drop. Condos and the ‘affordability’ issues will remain. The foreigners contributed to the rate of increase. High demand and low supply mean that we will continue to have rising prices. Perhaps at slightly slower rates. For more a more comprehensive version read my post: 15% Foreign Buyer Tax Impact. If you have a mortgage no change for you. If you are thinking of refinancing to pay off debt or renovate, probably no change but give me a call to discuss. Minimal impact in Vancouver. 90%+ of people buy for less than they qualify for and it won’t change what they buy. Will be a bit tougher for First Time Home Buyers which means those that don’t adjust their criteria will stay renting and keep rental vacancy ultra low which will see rents continue to rise. Over the longer term the changes will reduce competition in the mortgage space. The increase in balance sheet lending that is now needed will see the average person face higher rates to offset the increased risk assumed by lenders. In short, rates will go up a small amount more than they would have otherwise. For a more comprehensive version of my opinion and other upcoming changes and how they might impact you read my post: Impact On You – Mortgage Rule Changes Oct 2016. As we end the fall market rates typically trend up at this time of year. If for no other reason that a reduction in ‘specials’ available. We are currently in the 2.59% non special 5 year fixed rate range (I can get you better than this but this is the ‘safe’ rate available for most situations). I expect over the next quarter we will see that value be in the 2.79-2.99% range. Maybe even back into the low 3%. Still insanely low historically speaking. 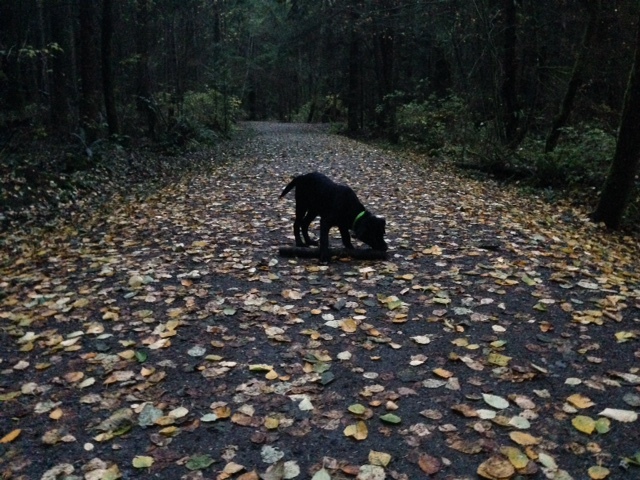 Photo: Greg Viger – Mundy Park – Waterline trail with Sloan Oct 2016. Sloan is a PADS.ca 4 month black lab service dog in training that we volunteer rais and train. PADS is a non profit that provides enormous benefits as intervention dogs, victim service support dogs as well as disabled services. Please consider making them part of your annual list of charities you donate to. Even a simple $20/year can make a difference if we all chip in a small amount. Donate now.